A trailer for It: Chapter 2 should be coming fairly soon — but, at CinemaCon 2019, director Andy Muschietti shared several minutes of footage with exhibitors, adding that this was the first time anyone outside of the studio had seen anything from the movie. In the footage, we see a grown-up Beverly (Jessica Chastain) knock on the door of an old apartment. The name on the door says “Kersh,” but when an old woman answers, Beverly explains she thought it said “Marsh”, because she’s looking for her father. The woman opens the door and says she’s sorry to be the one to tell her, but Mr. Marsh passed away. But come on in, it’s the least she can do. After a few beats too many, she reanimates and asks Beverly what it’s like being back in Derry. Beverly says it’s strange, and Mrs. Kirsh asks “Strange, how?” Meanwhile, we looks closer at Mrs. Kirsh’s chest and it looks be be very, very burned. Then there’s a ding! Mrs. Kirsh has been making cookies. At this point, Beverly wants to leave but Mrs. Kirsh insists she stay. She goes into the kitchen as Beverly begins to look at more photos. As Beverly looks, in the background we see Mrs. Kirsh peeking in at her in a very, very uncomfortable way. Beverly asks about the photos and Mrs. Kirsh says they’re of her and her father...who moved to Derry and joined the circus. She’s still creeping around in the shadows when we cut and realise who her father is. A clown. The footage then cut to a montage. We see the Losers’ Club reunited and older, looking at their younger selves in a reflection. We see Bill (James McAvoy) tell Beverly, “We can do this, but we have to stick together.” Pennywise is floating above the town holding balloons. We see another shot of him ripping his own face off, followed by two white hands reaching out of the darkness to grab a small red light. 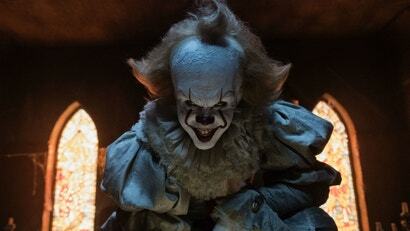 Then, out of those shadows, we hear a “Hello!” and Pennywise pops out his face. It: Chapter 2 hits theatres on September 5.